﻿ 6 Things You Can Learn from Your Email Analytics » Red Mango Marketing! Making sense of your email analytics can be tricky at first. How do you know which numbers to focus on? What do all those numbers really mean anyway? Is this really worth your time? To approach your email reports with confidence, you have to understand what information you have available and how to use that information to improve your strategy. 1. Who read your email? Within your email reports, click on the number of people who opened a particular email. This takes you to a list of all the people that opened that campaign, as well as the time that they opened it. 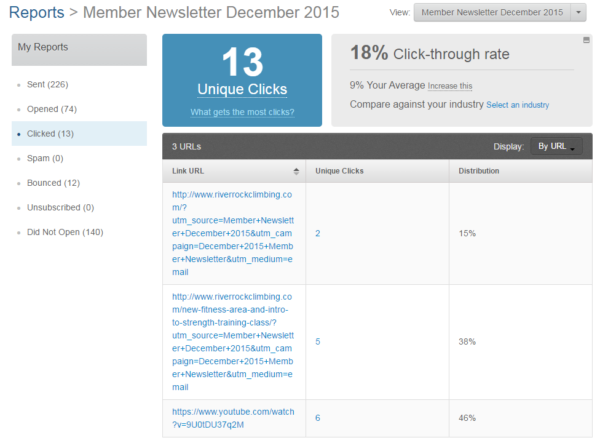 You can also see your open rate, your average open rate, and how you compare to others in your industry. As you can see in this example, from River Rock Climbing, their December 2015 newsletter received a 35 percent open rate — a nice jump from their average of 17 percent. Next steps: After looking at their email opens, River Rock Climbing knows which people are actively engaged. As a next step, they could tag these contacts and follow up with another email to provide a special, such as a class discount. By rewarding their most loyal members, they’re providing a good incentive for taking action. 2. What did your subscribers find interesting? Next, take a look at the “Clicked” tab. This will show you how many clicks your email received, your click-through rate for this email, your average click-through rate, and how you compare to others in your industry. This is a great indicator of what information is most interesting and relevant to your audience. River Rock Climbing received 13 unique clicks in this email, generating an impressive 18 percent click-through rate. From the information below, you can see that a YouTube link received the most clicks — indicating that video content resonates well with their audience. Next steps: Your email clicks can help guide the content you create. Notice what topics and types of content are getting the most attention from your audience and continue to send information that’s tailored to your audience’s interests. You can get extremely targeted by following up with people who clicked on a specific link. For example, if the YouTube video was about a climbing instruction class, River Rock Climbing could reach out to the six people that watched the video with information about an upcoming class. This helps River Rock Climbing move people through the buyer’s journey and move them closer to taking action and making a purchase. 3. When’s the best time to send your email? As mentioned above, you can see when your email subscribers are opening your emails. Take a quick look and make sure your sending schedule is in line with when most people are opening. You can Find the Best Time to Send an Email using industry trends and best practices that have worked for other businesses. Next steps: Once you find a time that works well, be consistent so your audience starts to expect your emails. You can even create the expectation right at the point when a new contact signs up. If you always send emails on Friday morning, let your subscribers know by telling them in person and in your online sign-up form. 4. On what device are people reading your email? You already know that more and more emails are now read on a mobile device. But these numbers also vary, depending on your audience. Visit the “Campaigns” tab to see how many people are opening your emails on desktop versus mobile. The stats are consistently updated to reflect the data from your last five campaigns. As you can see below, over 55 percent of River Rock Climbing’s email subscribers are opening from a mobile device. Next steps: No matter what your exact distribution is, using a mobile-responsive template is key to ensuring your subscribers are getting the best experience. Use a mobile-responsive email template so your email adapts to whatever size screen it’s viewed on. 5. How can you do better next time? As you start to dig deeper into your email analytics, it’s inevitable that you’ll find areas where you want to improve. Below is a chart to help you identify some opportunities if you feel stuck. 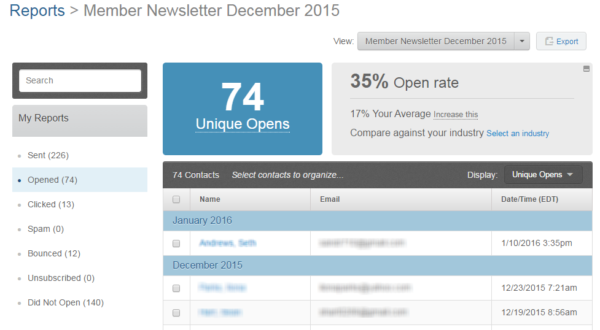 Two very common questions are: How can I improve my open rate? And How can I improve my click-through rate? To increase opens, find that best time to send and be consistent with your delivery. It’s also important to craft a compelling subject line so you’re making a good first impression in the inbox and enticing people to open. Lastly, check in with your audience and make sure you’re sending them information they find valuable. Ask people in-person, or send an online survey, to better understand what they’re looking for. 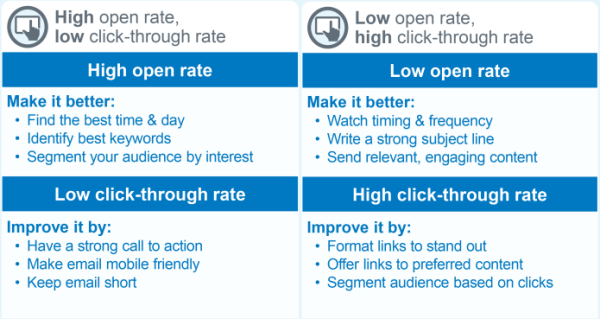 Low click-thorough rates are usually an indicator that you need a stronger call-to-action. Tell your audience clearly what action you’d like them to take next — whether it’s to come into the store for an event, register for a webinar, donate, or shop online. Keep your information concise and make sure your message is clear no matter what device people are reading on. Next steps: Improving your results is a learning process. Set clear benchmarks and work towards them. Your best bet is to stay focused and try to improve in one area at a time. Check out some of our top email marketing best practices here and choose one area to focus on. 6. Why is email marketing worth your time? Without a strong grasp on your email analytics, this question might be a little hard to nail down. Sure, you know email is a good way to reach your audience, but how is email marketing impacting your business and bottom line? Map your email efforts to a desired business result and track your success. If your business goal is to increase online shopping, look at your click-throughs and monitor you online orders. If you want to drive more donations during the holiday season, create a series of emails and total the contributions that come from your email subscribers. Seeing your efforts pay off and understanding the specific impact your emails are generating will give you confidence in your approach and motivate you to do more with email marketing. Email analytics, without the headache. You don’t have to be an analytics expert to measure the impact of your email marketing efforts. Take some time exploring your email reports, choose one area you want to improve in, and check in after each email to track your results. Log in now to see how your last email performed. Not a Constant Contact customer? Start your free 60-day trial today. Learn more about email analytics in our free workshop, See the Impact of Your Email Marketing With Reports. You can watch a recording here. 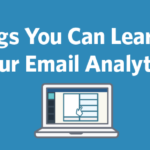 The post 6 Things You Can Learn from Your Email Analytics appeared first on Constant Contact Blogs. This entry was posted on Wednesday, April 20th, 2016 at 9:45 am	and is filed under Email Marketing, News & Updates. You can follow any responses to this entry through the RSS 2.0 feed. Both comments and pings are currently closed.